Steven Crowell has been for many years a leading voice in debates on twentieth-century European philosophy. This volume presents thirteen recent essays that together provide a systematic account of the relation between meaningful experience (intentionality) and responsiveness to norms. They argue for a new understanding of the philosophical importance of phenomenology, taking the work of Husserl and Heidegger as exemplary, and introducing a conception of phenomenology broad enough to encompass the practices of both philosophers. 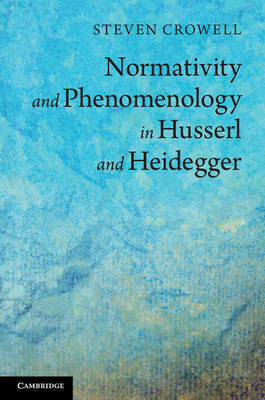 Crowell discusses Husserl's analyses of first-person authority, the semantics of conscious experience, the structure of perceptual content, and the embodied subject, and shows how Heidegger's interpretation of the self addresses problems in Husserl's approach to the normative structure of meaning. His volume will be valuable for upper-level students and scholars interested in phenomenological approaches to philosophical questions in both the European and the analytic traditions.